The Office for National Statistics (ONS) published its latest data on productivity on Wednesday 7 February [Note 1]. Not only has some of the recent data been revised but it is now based on a different method of estimating output at the sub-regional level [Note 2]. A comparatively low level of regional productivity matters because this is likely to cause wages and hence living standards to be relatively low as well. 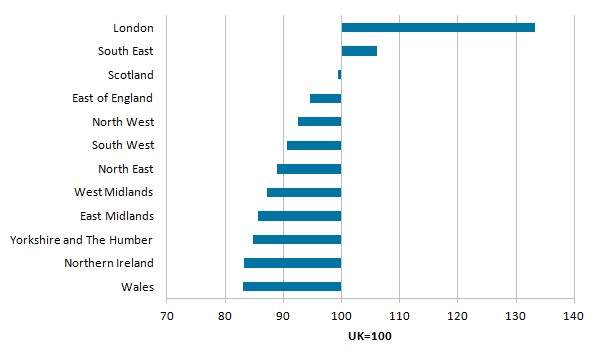 These data confirm Northern Ireland’s considerable productivity shortfall compared to most other UK regions. Northern Ireland also continues to lag behind international averages. 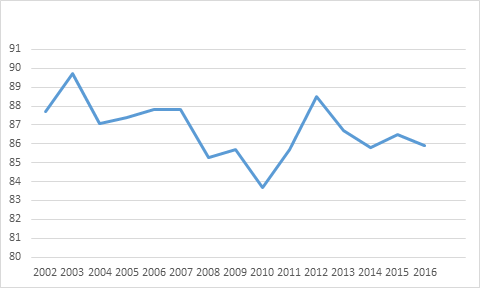 The shortfall has increased in recent years, however, these figures imply that the extent to which Northern Ireland has been falling behind since the mid 2000s was been less marked than was previously indicated. Northern Ireland’s comparative productivity performance displayed considerable volatility. However, it is implied that Northern Ireland output per hour level fell back compared to the UK average when 2016 is compared to the position four years before. When the output per job filled measure is used there is volatility in Northern Ireland’s comparative performance. That said, the Northern Ireland level of productivity was considerably lower than the UK level in all years and the level in 2016 was lower than that in either 2012 or 2003. 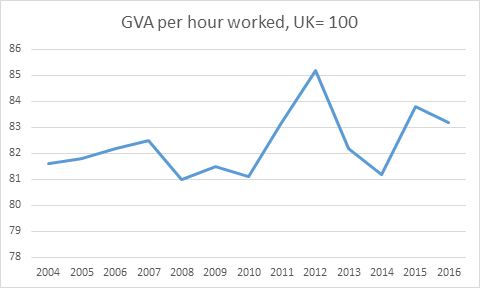 The ONS data indicates that in 2016 Northern Ireland’s GVA per hour was 83.2% of the UK average and the Northern Ireland level of GVA per job filled was 85.9%. If these results are compared with the most recent ONS data on the UK’s level of output per hour and per job compared to Germany (October 2017) then it is implied that German output per hour was 62% higher than the Northern Ireland level and output per job 27% higher [Note 3]. In approximate terms, the average German worker was able to produce as much in three days of work as his/her counterpart in Northern Ireland in five days of work. This points to the importance of comparative productivity as a critical determinant of variations between regions and nations in terms of competitiveness and living standards. Using the gross value added (GVA) measure of output which is very similar to GDP. See, ONS February 2018, Regional and Sub-Regional Productivity in the UK, February 2018. These are the first results using “balanced estimates” of regional output: an attempt by ONS to produce a single measure at the regional level based on what are deemed the most reliable indicators in terms of either the income or output measures of GVA. These results imply the average level of hours worked per worker in Germany was considerably lower than either the UK average or the level in Northern Ireland. For the purposes of this comparison a Northern Ireland/UK comparison in terms of GVA was linked to a UK/Germany comparison in terms of GDP.